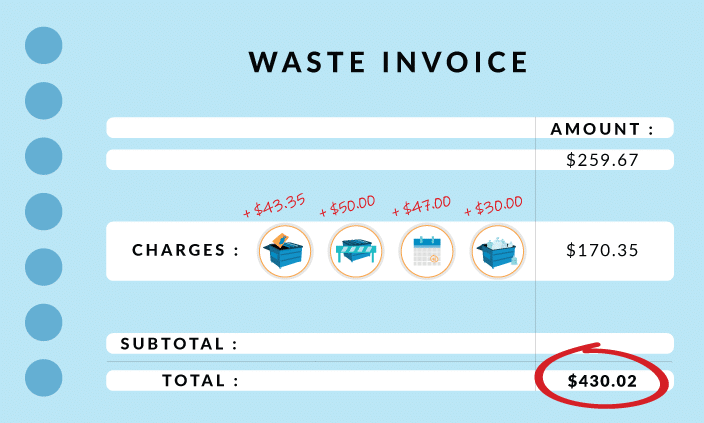 Most business owners and managers would agree that understanding your waste invoice can be frustrating, to say the least. Oftentimes, it’s not clear why your business is being charged extra for something, or if you are being charged fairly. In this post, we dive into the most common charge types that can show up on your invoice and provide tips for identifying and avoiding erroneous charges and service fees. A Dry Run, also known as a Trip Fee, is when the hauler came to service your business but the containers were empty, or they could not be serviced due to obstacles being in the way that interfered with loading/unloading the containers. Tip: Stage the equipment in an area that is free of obstacles (parked cars, locked gates, etc.) and keep the area clear during the pick-up window. If the containers aren’t regularly filled, switch to an on-demand pickup schedule. This charge is applied when the materials are contaminated. Contamination: the wrong materials are in the container, or the right materials are contaminated in such a way that they are not recyclable. Contaminated materials are extremely difficult to process, and oftentimes, your containers will not be serviced. Tip: Train your staff on the importance of avoiding contamination and the proper disposal processes for the waste and recycling materials you generate. Extra Yardage charges occur when the container is filled over capacity. Haulers cannot legally transport a load weighing more than 10 tons. A good rule of thumb is if the lids can’t close, then extra yardage charges will be added. Tip: Breakdown all cardboard boxes – when broken down, the less room they take up. One of the main reasons for extra yardage is due to cardboard boxes not being broken down. Also known as an Exchange, this charge occurs when your business needs to swap out an existing container for a new one. Tips: Upon the implementation of new waste services, ensure you have the proper container sizes to accommodate your waste generation and eliminate the need for a container swap down the road. This charge is applied for the removal of a container due to the termination of a contract and/or no longer needing the equipment. Tip: If your containers aren’t being utilized to their full capacity between pickups, you may be able to avoid a container removal by adjusting the collection frequency. This is a one-time charge that is applied for the delivery of new containers on a per container basis. Tip: Scheduling more frequent pick-ups or switching to an on-demand pickup schedule may eliminate the need for additional containers. Tip: Choosing the right container will go a long way in helping you get the job done, and mitigate the need for extra pickups. Late fees are generally applied each day the bill is not paid. In some instances, your containers will not be serviced until the delinquent balance is paid. Tip: The best way to avoid late fees is to pay your bills on time! STILL HAVE QUESTIONS ABOUT YOUR ACCOUNT? Hopefully this resource will help you understand the extra charges that can be applied to your invoice and how they differ from one another. If you still need help understanding your invoices or believe you are being charged unfairly, RoadRunner works on behalf of our customers to identify erroneous charges from 3rd party haulers, ensuring you are always paying the right price and know what is going on with your bill. No hidden fees or surprises! If you’re interested in learning more click below to get in touch!